Background: The Law Organizing the Lists of Terrorists and Terrorist Entities (commonly known as the Terrorist Entities Law), Law No. 8 of 2015, went into effect after it was ratified by President Abdel-Fattah El Sisi and published in the Official Gazette edition dated February 17, 2015. It had been approved by the cabinet in December 2014, during a period in which there was no sitting parliament. In January 2016, the law was retroactively approved by the House of Representatives in a hasty process that involved the review of 341 decrees in 15 days once the legislature reconvened; per the Egyptian Constitution, legislation passed in the absence of a sitting parliament must be discussed and approved within the first 15 days following the legislature’s seating. 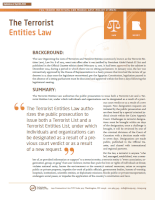 Summary: The Terrorist Entities Law authorizes the public prosecution to issue both a Terrorist List and a Terrorist Entities List, under which individuals and organizations can be designated as a result of a previous court verdict or as a result of a new request. New designation requests are initiated by the public prosecution and are then heard by a special criminal judicial circuit within the Cairo Appeals Court. Challenges to terrorist designations must be brought within 60 days of the designation; once a challenge is brought, it will be reviewed by one of the criminal divisions of the Court of Cassation with a decision made within seven days. Designations are made public, published in the Official Gazette, and shared with international and regional partners. Per the law, a terrorist is anyone “who led, managed, established, was a member of, or provided information or support” to a terrorist entity; a terrorist entity is “every association, organization, group, or gang” that uses violence; incites fear; puts the lives or rights of individuals at threat; violates national unity; harms the environment or the country’s natural resources; seizes or occupies public or private property; impedes the work of public officials, government bodies, homes of worship, hospitals, institutions, scientific entities, or diplomatic missions; blocks public or private transportation; endangers social peace; or impedes the application of the country’s constitution and laws. Following the designation of a terrorist or terrorist entity, the law authorizes “competent state bodies”—a term that is left undefined by the law—to dissolve the entity, bring to a halt its operations, close its buildings, ban its meetings and membership, stop its financial activities, freeze its property and assets, and temporarily deprive the individual or entity of their political rights. Significance: The Terrorist Entities Law sets forth an official process through which an individual or entity can be designated as a terrorist or terrorist entity. However, the law’s reliance on a broadly worded definition of terrorism raises serious questions on the vast discretion given to authorities throughout the designation process and the ways in which that process can be manipulated and subjected to politicization. Legal Context: Prior to the Terrorist Entities Law, there were two other ways through which to designate an individual or entity as a terrorist: (1) court rulings by the Courts for Urgent Matters and (2) government decree. The Terrorist Entities Law does not address either type of prior designation explicitly, raising questions on whether such designations might continue and whether prior designations per these processes would be considered valid. When it was passed, the Terrorist Entities Law upheld and slightly expanded the definition of terrorism per the Egyptian Penal Code; since then, however, the Counter-terrorism Law (Law No. 94 of 2015) has been passed and is currently the source of the official state definition of terrorism. Most recently, the Terrorist Funds Law (Law No. 22 of 2018) lays out a legal process for the seizure, management, and use of assets that follows the designation of terrorists and terrorist entities. Political Context: On July 24, 2013, then-Defense Minister Sisi requested a popular mandate to combat terrorism, marking the official beginning of Egypt’s war on terror. At the time of Sisi’s declaration, the number of terrorist attacks in Egypt had spiked to unprecedented levels with the majority of attacks concentrated in the Sinai region. In light of Egypt’s war on terror, in the name of national security, and in the time since, the government has conducted counter-terrorism operations, restricted civil liberties via the use of vaguely worded legislation, arrested and imprisoned citizens, and declared a state of emergency. 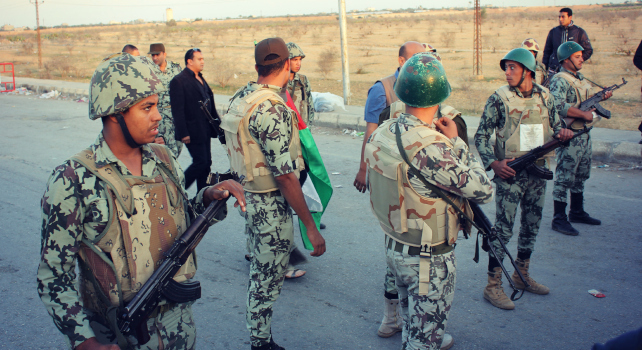 While the international community recognizes the right of states to take effective counter-terrorism measures, the United Nations General Assembly has affirmed that states “must ensure that any measure taken to combat terrorism complies with their obligations under international law.” Egypt’s domestic and international legal obligations mandate that the country respect the rights of citizens to due process and freedom of expression and association; a legal scheme that relies on an increasingly politicized judiciary, furthers vaguely worded legal definitions, and gives broad discretion to undefined state and security entities calls into question many of these obligations. Implementation: Since its ratification, the Terrorist Entities Law has been implemented on a number of occasions; a few examples are included here. In December 2017, the Cairo Criminal Court designated 161 individuals as terrorists in Case No. 653 of 2014, popularly known as “the seizure of Muslim Brotherhood funds” case. In May 2018, the Cairo Criminal Court designated 241 individuals as terrorists in Case No. 1000 of 2017 involving Wilayat Sinai. In June 2018, the Cairo Criminal Court designated 187 individuals as terrorists in the case popularly known as “the pioneers of Hasm.” In February 2019, the Court of Cassation accepted an appeal and removed the names of 296 individuals who had been designated as terrorists in July 2017 as part of Case No. 316 of 2017, popularly known as “the military wing of the Muslim Brotherhood” case. Text of the Law: The full text of the law is available in Arabic here; an unofficial English translation is available here.